Here we are; muddy as they come. On our best day, we can put on a show for about ten minutes that is until one of the kids pours water down the other ones back or my son decides to tackle one of his sisters. We are messy- muddy- but aren’t we all? We all have a little mud in our lives. Freedom comes when we embrace the mud. 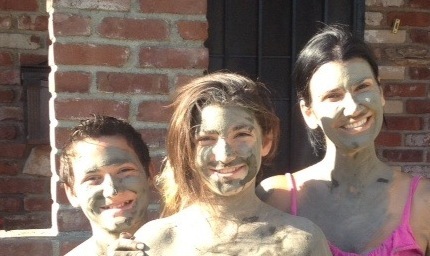 So, in our house, we say, “Bring on the mud!” Sometimes I tell the kiddoes, “I’m not sure what I am doing here. I make mistakes. We all make mistakes. I’m going to need do-overs and so will you, but dear ones, we are in this together.” Team Medders. Isn’t that what we all need, someone who loves us not only when we get all cleaned up. Don’t we all crave to be loved right where we are, mud and all? Isn’t that what Christ does? He doesn’t tell someone to change first and then come talk to him. NO. Not at all. He says, “I will come to you. I will meet you in the mud. I will meet you just where you are. No need to clean up or put on your Sunday best. I will come to you.” Have you ever wondered why we keep cleaning ourselves up, only to be sitting in the same muddy pit time and time again? Then, stay put sister- STAY PUT. He isn’t put off by your mud. You are. It’ s in the mud that He can sit with you and talk with you about what’s really going on. And that’s what He wants- you-time with you- being you- being real- you.